Pioneer Magnetics will provide regular updates on new products, interesting aspects of the company as well as perspectives of the power supply industry. Product updates may come via news releases, which are an important aspect of PMI’s Sales/Marketing endeavors geared to provide the latest information. “Click” on the below “News Releases” for further information. In same 5 kW space, end user can double power with Pioneer Magnetics (PM38220B) 10 kW, AC-DC (48 Volt) unit or the space allocated could be cut in half. 23W/in3 power density in 230 VAC and 480 VAC, 3-Phase configuration. Voltage and current programmability, PFC, over voltage and over current protection, fan cooled, and other options available. Designed to meet Safety. 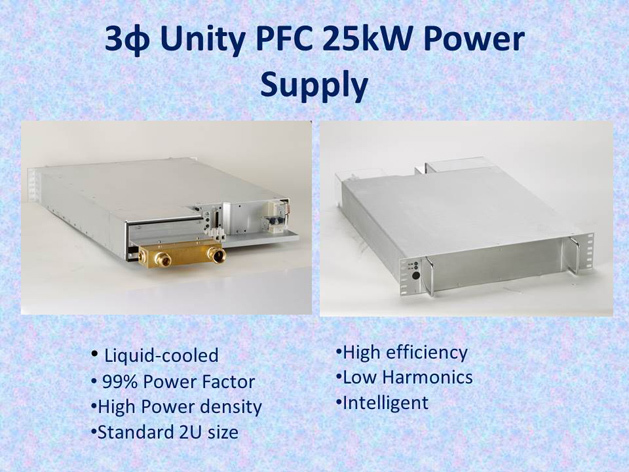 Pioneer Magnetics continues to set new standards with the expansion of its liquid cooled product line to include the 32 Volt @ 780 Amp PM37223-10P – A 25 kW power supply in a 2U package that yields a power density of 19 Watts/in3. 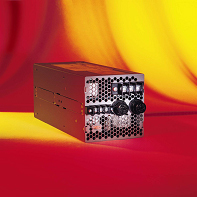 The innovative, highly efficient 3-phase power supply operates from 0ºC to 50ºC with an input range of 365 to 528 VAC. A variety of standard options are available such as fully floating output, over current, over voltage, over temperature protection, and several variations of voltage and current programming. The company is currently working on projects in a variety of commercial and military applications such as supercomputers, lasers, broadcast transmitters, and radar systems. Pioneer Magnetics has been designing high wattage power supplies in the same Los Angeles area headquarters location for more than 50 years. Pioneer’s Modular PFC Product Series can also be used in applications where 400VDC non-isolated single output bulk power converter is required. With PFC, output power can be maintained with a 30% reduction in RMS line current. Other advantages include improved hold-up performance, reduced line harmonics, and insensitivity to voltage and frequency variations. Because they effectively eliminate harmonic currents, the converters are ideal for applications where neutral wire current exceeds recommended ratings due to waveform distortion caused by the typical off-line units. 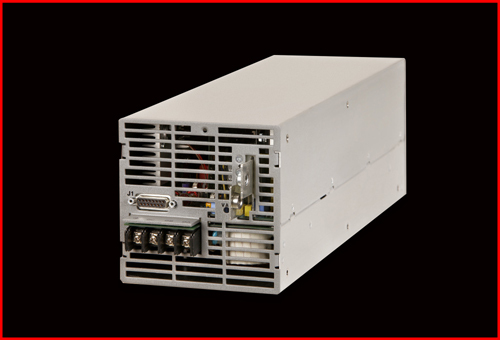 With wide AC input range, 90 to 264VAC, 1P or 3P, the bulk power supply can deliver 10kW of output power in a 3U” package with operating temperature ranges from 0°C to +50°C at full load. The converter is housed in a self-contained, forced air-cooled enclosure. The DC output is brought out to a 6-32 screw terminal and is protected by a built in DC fuse. The AC input is via the 8-32 screw terminal barrier block and is protected by an internal AC fuse. A load enable output signal is provided to indicate when the load should be enabled. The bulk supplies are designed to meet agency requirements for UL, CSA, TUV EN60950-1 and conducted and radiated EMI to EN55022 Level A. Pioneer Magnetics introduces the PM33216B, a new breed of programmable 15V to 70V PFC power supplies providing full output power up to 6 KW with single or three phase AC Input from 180 to 264 VAC or three phase AC Input to 365 to 528 VAC. The output voltage and current are linearly programmable from 5% to 100% via an external analog input from 0V to 5V or 10V. Designed to support both stand alone and parallel configurations, these models are configured both in standard Non-Plug and Hot Plug I/O interface. The 5” X 5” units have internal forced air cooling and built-in protection from electrical overloads. Dozens of standard options are available including variable speed fan control. Custom options are also available. Because of the programming flexibility, these new power supplies are being used in many renewable energy applications such as solar, wind, fuel cell and flywheel applications. Pioneer Magnetics has been designing high wattage power supplies from the same Los Angeles area headquarters location for more than 50 years. Pioneer Magnetics has introduced a product designed for High Voltage applications requiring a compact form factor. PMI Model PM3329 provides 250V @ 2,000W in a 5” x 5” x 11.25” standard case. This unit can be ordered with single phase (.99 PF) or three phase (0.95 PF) input voltage range of 90 to 264 VAC. Power is de-rated at 90VAC. These units also have a variable speed fan option. The fan speed is controlled by inlet air temperature and changes speed automatically with 0%, 50% and 100% load changes. The unit is also built with full compliment of alarm and monitoring signals like remote/enable, DC good, current monitor and AC power fail. Capable of full power operation from 0° to +50°C. Built in over current, over voltage and over temperature protection are standard. Product meets agency requirements for UL, CSA and TUV to EN60950-1 and EMI to EN55022 Level A. 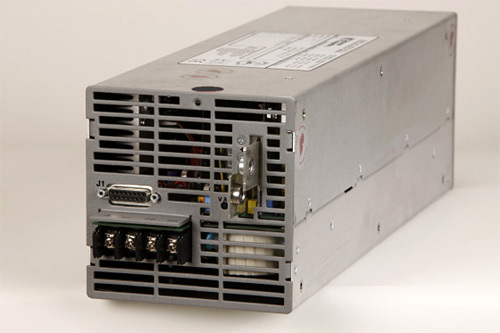 Pioneer Magnetics introduces the First 8.1 kW Three Phase 0.95 Power Factor, 400/480 VAC Input switching power supply. Packed with 8.1 kW of quality and reliable power, this state of the art product comes in PMI’s standard setting 5 " x 5 " compact case with Power Density up to 21 watts/in 3. The new 48 Volt power supply features internal forced air cooling providing full power continuously over operating temperatures from 0 ° C to +50 ° C. The rugged design with an AC range of 365 to 528 VAC making it perfect for all applications where 3P 400/480 VAC industrial power is used. Pioneer Magnetics, announces the introduction of the PM37223-10P a power factor corrected, 360V @ 30kW liquid-cooled AC-DC power supply with power density of 27.4w/in3 in a 2U 19” rack configuration. This is one of a series of high power products that will include air-cooled versions and a wide range of output voltages. At a high efficiency of >92% at 80% of load, the PM37223-10P provides a 360 Volt at 83 Amp, remote sensed, fully floating, Over Current (OCP), Over Voltage (OVP), and Over Temperature (OTP) protected output. The input voltage is 408 to 528 VAC, 3Ø with Power Factor Correction (PFC) of >0.95 at full load. 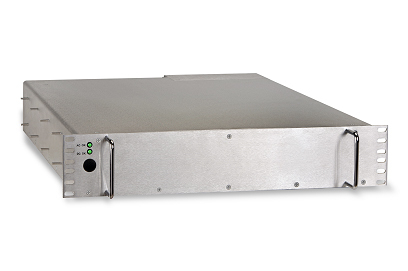 The PM37223-10P is a semi-modular unit housed in a 3.47” x 17.38” x 24.4” liquid-cooled plate enclosure. It is designed to meet regulatory agency TUV to EN60950-1, EMI Conducted & Radiated to EN55022 Level A, and EMC to EN50082-1. The unit comes with mounting ears for a standard 2U 19” rack. Typical uses of liquid cooling are found in many applications such as supercomputers, test equipment, industrial, broadcast, and metal and chemical manufacturing applications that depend on regulated and highly reliable DC current power supplies. Mr. Rosenstein also mentioned, IBM’s 2006 Power and Cooling Technology Symposium, Darnel Digital Power Forum, and most recently, Applied Power & Engineering conferences, where liquid cooling was discussed and demonstrated to be superior to air-cooling for many high power applications. Some of the benefits discussed were the reduction of physical size, reduction of operating costs due to higher conversion efficiencies, and reduced acoustic noise due to fan elimination. Pioneer Magnetics (PMI), with headquarters in Santa Monica, CA, with global sales offices and with local as well as offshore manufacturing capabilities, has 50 years as an industry-leading supplier of high-power switching power supplies. PMI also has the ability to create custom power solutions in industry standard configurations. Pioneer Magnetics, announces the introduction of an upgrade version of the PM37223P-10P a power factor corrected, 42V @ 25kW liquid-cooled AC-DC Hot Pluggable power supply with power density of 17w/in3 in a 2U 19” rack configuration. This is the first model in a series of high power density products that will include an air-cooled pluggable version. At a high efficiency of >91% at 80% of load, the PM37223P-10P operates continuously at full load with inlet water temperature of 60°C. The unit is built with remote sense, output fully floating, Over Current (OCP), Over Voltage (OVP), and Over Temperature (OTP) protected output. The input voltage is 365 to 528 VAC, 3Ø with Power Factor Correction (PFC) of >0.95 at full load. The PM37223P-10P is a semi-modular unit housed in a 3.47” x 17.38” x 24.4” water-cooled liquid plate enclosure, built with two modules: a boost PFC Input Module and a Main Output Converter Module. The PM37223P-10P, designed to meet regulatory agency TUV approval to EN60950-1, EMI Conducted & Radiated to EN55022 Level A, and EMC to EN50082-1, is competitively priced at $6,585.00 each in OEM quantities. Production quantities are typically available in 12 weeks. Mr. Rosenstein also mentioned, IBM’s 2006 Power and Cooling Technology Symposium, Darnel Digital Power Forum, and most recently, Applied Power & Engineering conferences, where liquid cooling was discussed and demonstrated to be superior to air cooling for many high power applications. Some of the benefits discussed were the reduction of physical size, reduction of operating costs due to higher conversion efficiencies, and reduced acoustic noise due to fan elimination. Pioneer Magnetics (PMI), with headquarters in Santa Monica, CA, with global sales offices and with local as well as offshore manufacturing capabilities, is the industry-leading supplier of high-power switching power supplies. PMI also has the ability to create custom power solutions in industry standard configurations.